It is scientifically proven that the more your fingers move, the more informed would be your brain. 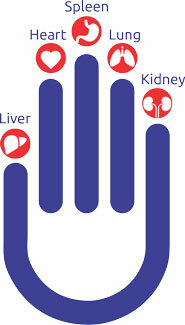 The fingertip peripheral nerve can affect our five major organs (as depicted in the image), referring to the five brain acupoints that correspond with the five organs. The position of different acupoints is reflected on the related distal of each fingertip, also is the specific path for children’s health cultivation. Through our UCMAS programme, the fingers and the sharp edges of abacus beads can be easily stimulated often by scrubbing to activate and strengthen the functions of five major organs and cerebral cortex. The 6 – Finger Manipulation, 10 – Finger Activation system, helps in the enhancement of the operation of the cerebral cortex. One of its many benefits is that it helps the Right Middle Finger to stimulate the Left parietal lobe. Ability of Writing and more.